RA & Weather: Do Storms Make You Hurt? It is that time of year again. The jet stream is dipping down into the central U.S., bringing with it front after front of cold weather. It happens every year, and I dread it every year. No offense, Lene Andersen, but Canadian air is sooooo cold Of course, when we are sweltering in humid Gulf Coast air, the Canadian air just doesn't visit. That would be July in Missouri. That is when we call our state Misery. I have an aversion to socks and shoes. If I could, I would go everywhere barefoot. Unfortunately, I might end up hurting my feet, and walking in snow with bare feet is not exactly a smart thing to do. In addition to that, I know I would get some stares, and possibly an ambulance ride to the mental hospital in Fulton. All kidding aside, I find these cold fronts that sweep down into my world this time of year very painful. When the barometric pressure drops, the RA Troll is merciless. I hurt everywhere, and normal pain meds just don't cut it. I imagine that I am "preaching to the choir" here. Most people I talk to with RA, Fibromyalgia and OA experience pain with each approaching front. Of course this also happens in the summer with thunderstorms. For me, the pain caused by thunderstorms doesn't seem to last as long as the pain brought on by winter storms. Last winter was especially painful for me. We had several snow storms. Snow storms usually linger longer than thunderstorms in our part of the country. Those snow-laden storms also set off my Fibromyalgia. This may sound overly dramatic, but I honestly felt as though someone had poured boiling hot water over my legs, especially my thighs. I was in agony until the storms passed. Fortunately, I now have additional pain medications to use when my pain gets out of hand. I also take a low dose of an old drug, Elavil, for my Fibromyalgia pain, and it has provided a ton of relief. I hope it works this winter. Most of us have probably told our doctors about this "storm pain" at some point during our treatment. Some doctors say there is no proof that dropping barometric pressure causes pain. They say this is a myth. Most of my doctors agree that there is something going on with inflamed joints during storms. They say they do not understand exactly what happens to cause the pain, but they do believe their patients. One of the Physical Therapists I saw this summer explained his theory to me. He believes that when the barometric pressure drops, the pressure inside our joints increases. Since we already have joint swelling, this extra pressure can cause a lot of pain. I have read articles written my doctors who apparently share the same theory. What is it about humidity that makes us swell and hurt? I have no clue, and I haven't been able to find any information about humidity affecting people with RA, Fibromyalgia and OA. I do know that even before RA became my constant companion, I did not like high humidity. It always made my hands feel squishy. Sometimes it made my ankles swell. It always made my hair stand on end! There is some connection between humidity and RA, Fibro and OA. I am just not sure how the whole process plays out. Maybe one day science will provide us with an explanation for our increased pain during stormy and/or humid weather conditions. For now, I may not be able to explain it, but I do know that dropping barometric pressure aggravates the RA Troll living within my body. The Troll also seems to feed on humidity. I am wondering how many of you can predict when a storm is coming. Do you have increased pain when the barometric pressure drops? How about humidity? On a less serious note, I must tell you that I have found one way to make me feel better about wearing socks and shoes. 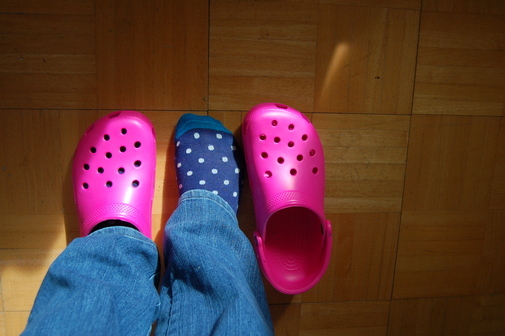 I like bright socks, and I adore my crocs. Please see a picture of my happy feet below! This is my way of adapting.